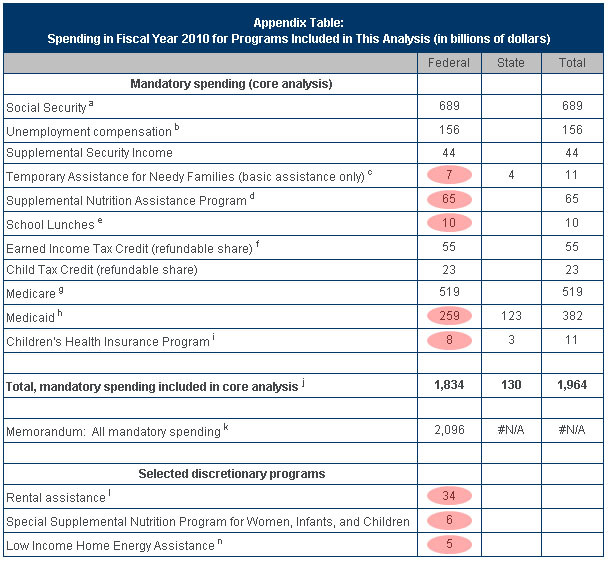 So the Center on Budget and Policy Priorities decided to add up the numbers and figure out how much money the federal government spends on the nonworking poor. The answer: about 10 percent of all federal welfare spending. How did they come up with that? CBPP’s methodology uses census data to figure out exactly where program dollars are going, but you can get pretty much the same answer using a simpler, easier-to-understand technique. Step One is to list every federal welfare program. Step Two is to deduct spending on the elderly, blind, and seriously disabled. That’s Social Security, Medicare, SSI, and about two-thirds of Medicaid. Step Three is to deduct spending that goes to the working poor. That’s unemployment compensation, EITC, and child tax credits. Step Four is to add up the rest. This overstates how much goes to the nonworking poor, since these programs are open to both working and nonworking families, but it gives you a rough idea. It comes to about $235 billion, the bulk of which is SNAP (formerly food stamps) and about one-third of Medicaid. That’s 12 percent of all federal welfare spending and about 6 percent of the whole federal budget. Once you account for the fact that some of these program dollars go to the working poor, you end up with CBPP’s estimate of 10 percent, or about 5 percent of the whole federal budget. Is that too much? I guess you have to decide for yourself. But I’ll bet most people think we spend a lot more than 5 percent of the federal budget on this stuff. They might be surprised to know the real numbers. The CBPP’s chart is below, with spending on the nonworking poor highlighted.